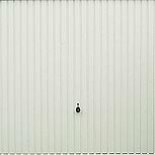 All these concrete garages are supplied with a horizontal ribbed up and over garage door as standard. You can also choose from Vertical, Georgian, Chevron and Side Hung in a range of colours as well as wooden side hung doors – it’s YOUR choice. Lidget Compton offers on the most comprehensive choice of wall finishes available. 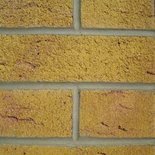 Whilst the standard Spar finish has been designed to blend with most properties, there are customers who want something different, we have introduced our GB patented and unique Brick, Stone and textured finish. 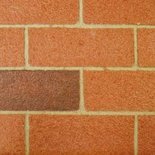 The Sectional Brick and Stone finish is a factory applied finish, and is applied using our patented method to produce a unique option. Uniquely the textured finish is site applied creating a totally seamless finish from Lidget Compton – the Best Concrete Garage. Whilst the Lidget Compton concrete garage looks splendid as standard there is an option to have front posts made from real brick to increase the ‘kerb appeal’ even more. With a choice of four brick effect and two stone effect there is certainly a great chance one will appeal to you. This Garaclad concrete garage cladding offered by Lidget Compton Concrete Garages brings a new dimension to concrete garages. When fitted your new concrete garage takes on a new look. 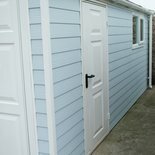 With the attractive feather edge style boarding, made from durable and long lasting PVCu, you can see your new garage being like a work of art. Well ‘beauty is in the eye of the beholder’. To me I would be delighted to have this is my garden. Six different colours – White, Light Grey, Sand, Cream, Light Blue and Enviro Green – to suit you. 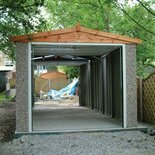 This is a very cost effective way to have a timber like garage in your garden. 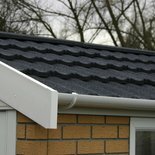 Lidget Compton concrete garages offers several types of roofs to suit the individual models. 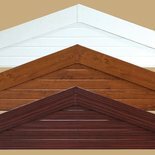 Essentially there are five basic shapes of garage roof and within these basic shapes there are several colour options. 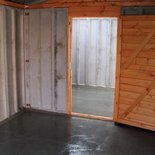 There is a large choice of optional personal or side access doors which will give you great flexibility when deciding the design of your new concrete garage. 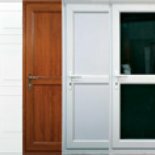 With a choice of timber, steel or PVCu in a range of sizes, styles and colours there should be a suitable option for you. Lidget Compton Concrete Garages include as standard on all their standard height buildings, a 4ft wide timber window. On concrete garages with extra height the standard timber window will be 3ft wide. 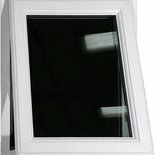 Take a look at the large range of single glazed as well as the double glazed PVCu windows in a range of styles and sizes. Lidget Compton Concrete Garages have a large range of optional extras for your new concrete garage enabling you to customised it to suit YOU. 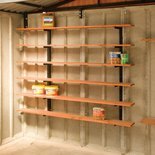 You could consider buying a larger concrete garage and incorporating a workshop within. The addition of a partition and side garage door will allow this area to be separate from your car. The standard window could be placed within the workshop area or you could add an extra window or even add translucent roof panels. Putting a concrete garage alongside your house can stop you gaining access through into the back garden. Lidget Compton has thought of this and come up with the Throughway. Essentially an extra door on the back of your concrete garage so you can drive straight through if you choose, or just move your car out of the garage and you can then carry those large items into the garden or to the back of the house.